Seeing is believing, but measuring is knowing! 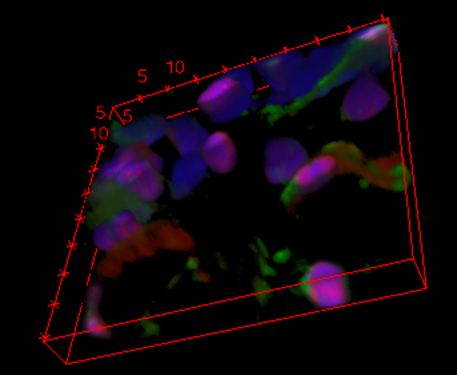 Learn how to do advanced image analysis and quantification on your 3D data sets from the SP8 confocal microscope. Measure volumes, surface areas, distances in space, apply 3D binary masks, and much more. A Leica Application specialist will demonstrate the capabilities of the 3D Analysis software available in the Advanced Microscopy and Imaging Center. If you have specific questions or a complex data set that you would like to discuss with the application specialist, please contact Dr. John Dunlap at jrdunlap.utk.edu and we will try to arrange a one-on-one consultation on that day. AMIC will be hosting a demonstration of the LIGHTNING imaging system by Leica. This upgrade to our SP8X confocal microscope will allow clearer images with increased resolution down to 120 nm. Importantly, this system allows for fast multi-color image acquisition up to 40 fps (512x512 pixels) without the use of special fluorophores or complex imaging routines. Simply use your normal samples and the program will help you select optimal parameters for image acquisition. No post-processing needed. More information can be found at this link. 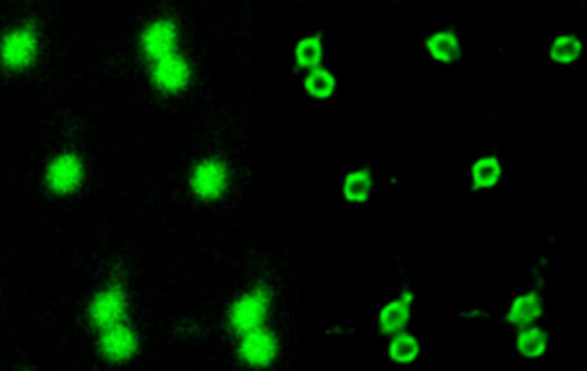 Paramecium with conventional (left) and LIGHTNING (right) confocal. Image provided by Leica Microscystems. The Leica specialist will be at AMIC on Tuesday and Wednesday, 9/25 and 9/26, for demonstrations. Bring your own samples and see the difference for yourself. If there is sufficient interest, we will try to upgrade our existing instrument to the super-resolution system. Please contact Dr. John Dunlap at jrdunlap@utk.edu if you wish to see the LIGHTNING system in action. Please include your preferred times and whether you will bring your own samples.